New York City's sea level could rise between 11 and 30 inches (28 and 76cm) by 2050. According to climate change reports, New York City's sea level will rise about 11 to 30 inches by 2050. Unfortunately, many of the current designs in NYC may not be able to handle the change. Given that New York is home to over 8 million people and is growing in population every year, this is a serious issue for architects to consider. 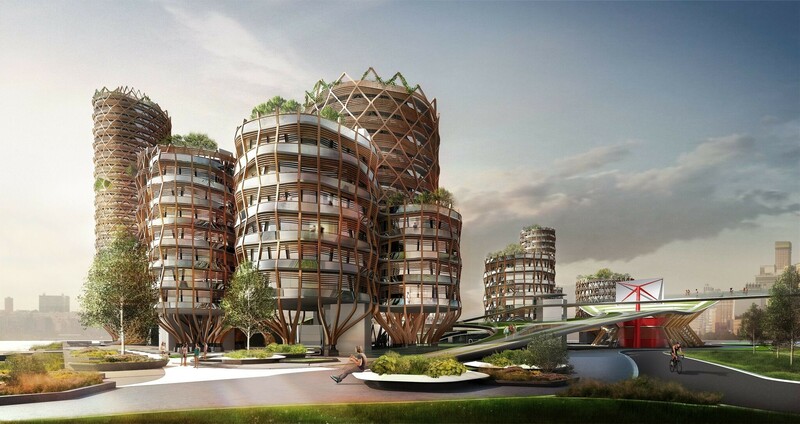 While architects are trying to find ways to house so many residents, others are anticipating how the environment may affect housing in the future as well. DFA, or D Form A, is a group of design architects who have created a housing proposal that may be able to withstand environmental changes. The conceptual proposal prioritizes issues like rising sea levels and affordable housing in the city from the start, hoping to make the building accessible to a more diverse range of occupants. 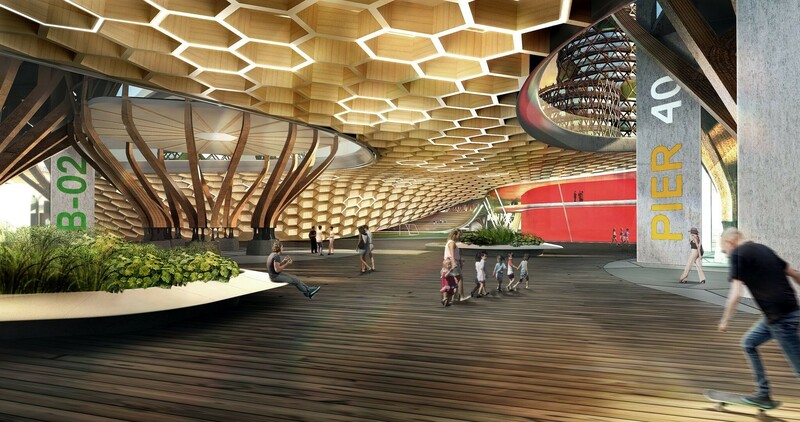 The proposed location would be on Manhattan’s Pier 40, which extends about 250 meters over the Hudson River. The Pier is currently in need of repairs and functions as a football field and car parking facility. DFA’s design was influenced by the Pier’s recreational use. 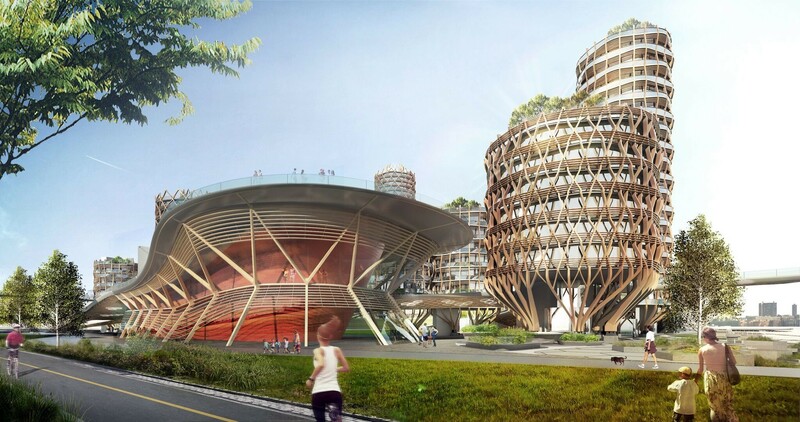 The design includes 19 cylindrical towers which would range anywhere from 96 to 455 feet in height. The towers would be organized in 11 groups and be reinforced by plenty of steel. The complex would also have several pods floating around the Pier to provide a buffer to protect against potential storm damage. 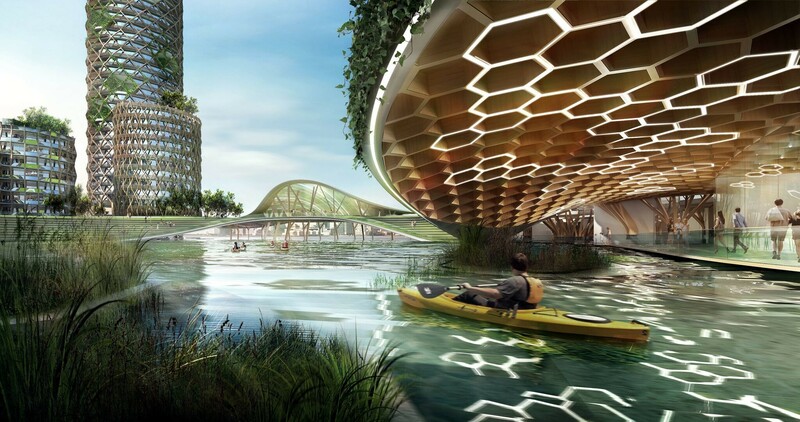 The development would be built to act like a floating island that can withstand significant sea level rise and flooding. The residential units would be elevated 60 inches above the anticipated storm surge levels. The design also includes a set of pathways that connect pavilions. One pathway is lower and would no longer be used around 2050, since water levels are excepted to have submerged the path by then. In this case, the second pathway, which is elevated, would act as a new way to get around the complex. Apart from its flood resistant features, DFA created this design to address the city-wide issue regarding affordable housing. It’s no secret that Manhattan real estate can be pricey. The 450 living units would be sold at prices ranging from affordable to market-rate. While this design is only an idea, and the organization that manages the pier may not be taking it on anytime soon, proposals like these certainly point in the right direction. How do natural disasters affect the economy? How can India fight back against floods?